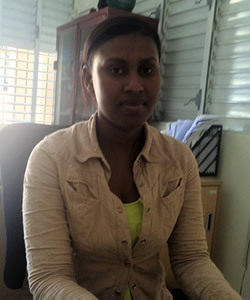 Noris de los Santos is a receptionist at Border Solidarity (Solidaridad Fronteriza) and a teacher at Christ's House (El Hogar de Cristo) in Dajabón, Dominican Republic. Border Solidarity works on migration issues related to the border between Haiti and the Dominican Republic. Christ's House is a Jesuit shelter for unaccompanied migrant boys from Haiti.